Ms. Betty Porter is in her 27th (and last) year with our district this year. 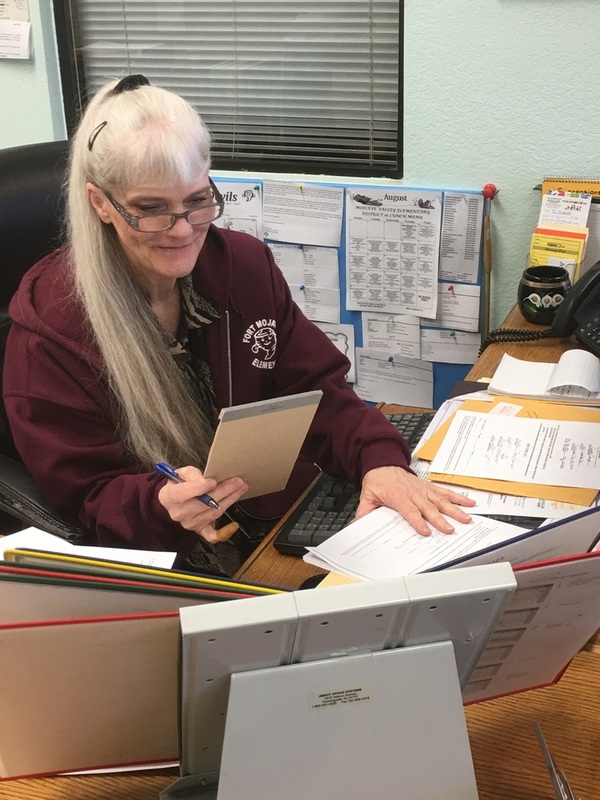 She has held many positions, but she is currently Fort Mojave Elementary's secretary. Betty is originally from California and has Veterinary Assistant Degree along with two years in with Mohave Community College. Fun Facts about Ms. Betty - she used to street race her cars after tuning them up (safely, of course); she has shown German Shepherds for Balzar Kennels; and she loves to raise and hand feed exotic birds. Betty's most rewarding moment with the district is when she received a "thank you" from a parent for changing her daughters live through fostering a love for reading. This was while she was a Library Clerk. Ms. Betty is retiring in a couple weeks, and she will be greatly missed!